Texas Fling is the cloned foal of one of the most decorated bucking horses of all time, Spring Fling. The bay mare made her first trip to the National Finals Rodeo as only a 3-year-old and earned her first of three Professional Rodeo Cowboys Association Horse of the Year titles the next year in 1997. “She takes four or five more jumps in eight seconds than just about any other horse,” said owner Milt Bradford of Big Bend/Flying Five Rodeo Company. Although Spring Fling is a name feared and revered in the arena, her owners have been unable to breed the mare successfully. Texas Fling, born in 2009, will now take the torch from the rodeo legend and pass along her genetics as a producer of future stars. 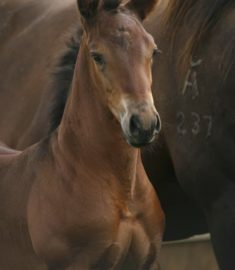 She has a foal on the ground produced from the cloned champion bucking stallion of Go Wild. Imagine the possibilities.